Census time is almost upon us. Tuesday, 8 March is census day. Every 5 years we get counted. The information is used for various official purposes and is available to researchers. It is obviously important that the information is accurate as it will be used by government and local body planners as well as researchers. I guess very few of us have problems answering the census questions honestly. But the religion question does seem to embarrass some. Perhaps that’s why people have an “object to answering “option. In particular people with no religion often feel compelled to claim one falsely. It’s considered by some to be anti-social to answer “no religion”. I guess that’s why my family has recorded various religions over the years – C of E, Presbyterian, Salvation Army. But my parents never belonged to a church as far as I could see. This year is also census year in the UK and Australia. 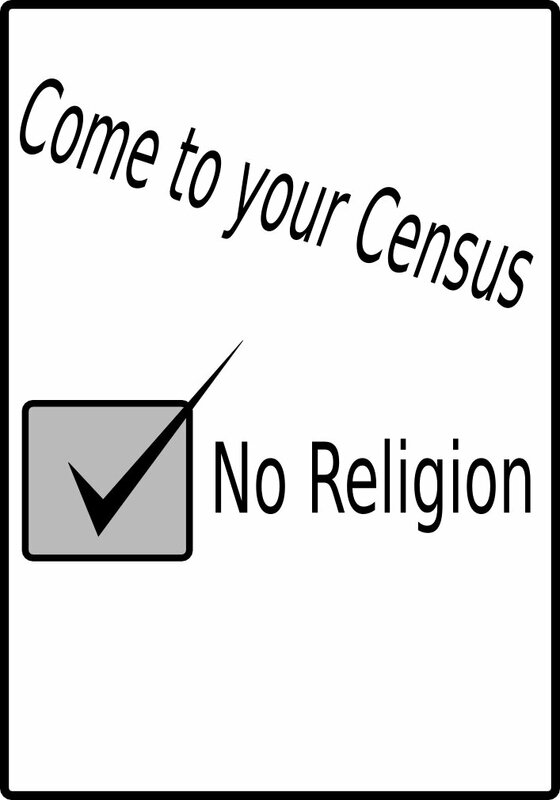 (see The Census Campaign – If you’re not religious for God’s sake say so and Mark No religion) and campaigns are underway in both countries to encourage people to answer the religion question more honestly. Nothing is underway here. perhaps we are just to laid back. But it is worth being honest. *Credit to Peter Jackson for “Come to your Census” graphic. Well, the religion thing aside, I’m not entirely sure that the census data is the great social planning tool it’s made out to be. A lot of the social and economic data it purports to collect, is now collected in other forms in a far more accurate and timely fashion. If you want to make changes to tax policy, you’re going to look at the IRD database, not the census. If you want to build roads, you’re going to study actual traffic flows & accident rates. We’ve had a perennial problem getting sufficient teachers in some areas, medical professionals in others, it’s slow and difficult to build new schools where they’re needed, old ones linger on. A 5 years cycle for the census isn’t timely enough for good knowledge. What we’ve learned is things can change very quickly over a 5 year period. Get a wave of immigration into Auckland- as we had happen in the early 2000s- and the census data is redundant. From 1985 to 1990, NZ and the rest of the world changed dramatically. In the early 1990s we were planting trees like mad, in the early 2000s, we were ripping them out and putting in dairy farms.